So this post is super late (as always I'm waaaay behind). This was a glitter french set of gels that I did on a friend in October for Fall. I actually ended up combining acrylic and glitter because I haven't mastered forming a smile line (the area of pink that creates the "french" look). So I started out by building smile lines out of cover pink acrylic and prepping the area for the gel application. I then added Light Elegance's Plumtastic and Sweet Potato glitter gels to the free edge area and curing under a UV lamp. 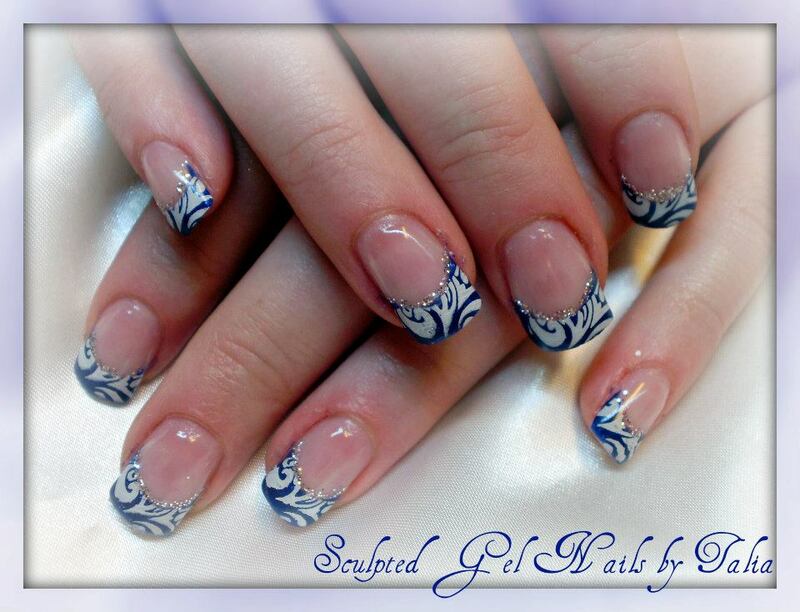 Then I capped the entire design with clear gel, cured, filed into shape and added a gel topcoat. I was completely out of cuticle oil... so excuse the horrible cuticles in the pictures. I have no idea why i wasn't thinking about lotion or something to solve the issue, but you know how it is - sometimes these things just escape you in the moment! Anyway, here's the final product, hope you like them as much as Janice liked them! 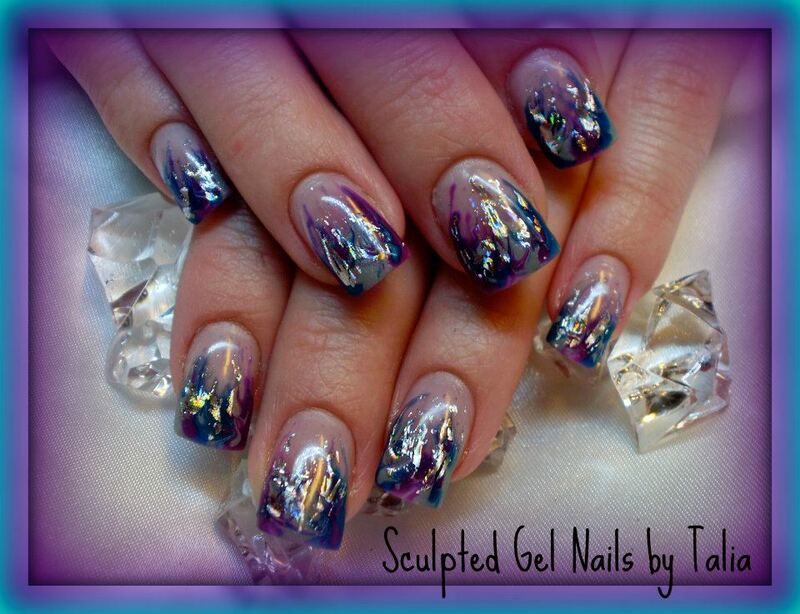 "I am a self employed Nail Technician with a little studio room set up at a local tanning salon here in town. I have been doing nails for 3 and half years now. I have always been interested in taking care of my nails and making sure that they looked really nice. I started getting gel nails done by a fellow Nail Technician and really enjoyed the whole process. 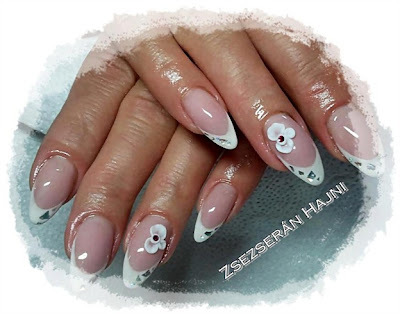 When she was taking some time off to have her baby, I decided to look into taking a nail course, at the time, to be able to do my own nails professionally and correctly. Nails was never supposed to be a full time job. 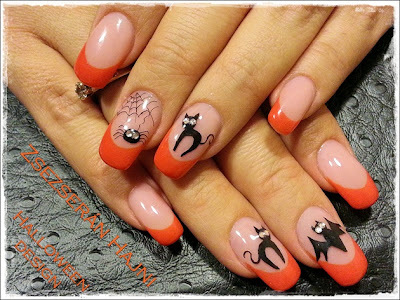 At the time that I took my nail course I was in University going for my Degree in Management. 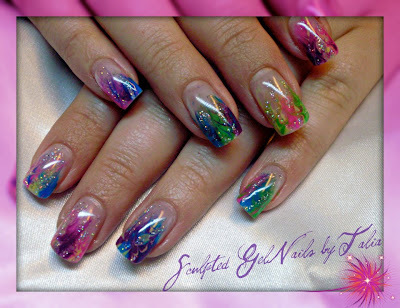 While in school, I worked part time, attended school full time and did nails on the side for some creative fun. After I graduated University, I started working full time at the local College in my town. I still continued to do nails on the side but I was loosing my drive for it and seriously considered stopping it completely. With working full time hours and doing nails in the evening and weekend it began to take its toll on me. Through Facebook, I have been able to connect, meet and interact with some very talented ladies in the industry from all over. They helped me understand many aspects of the nail industry that really opened my eyes. I learnt many new techniques, processes, rules & regulations, proper sanitation, nail art ideas and products and it really opened my eyes to what a great industry I was fortunate enough to be in. When my full time job position was cut short at the College, I had to make a decision... I felt like I was at a crossroads... it was either pursue a field in the industry I went to University for or pursue a career that I had fallen in love with. I moved my nail business to a studio room in a local tanning salon and haven't looked back. My business is a separate business from the tanning salon, I just rent a room in the same building, which is nice because it allows me to have the freedom that I truly wanted from running my own business. I absolutely love doing nails and everything that comes along with running your own small business. I use Amore base and finishing gels. That is not the line I trained with when I took my nail course, but I have switched to this line this year and I truly love working with it. For colored gels, I LOVE LCN color gels, they are my favorite to work with. For glitter gels I love Amore Pixie gels and I have recently started using Light Elegance glitter gels which I'm really liking. Nail art is my favorite part about doing nails. I love trying out new products, product lines, nail art tools and I try to stay on top of the new trends and products on the market, which my clients really appreciate." Not a whole lot has been going on with me these last couple days. It's December, and I'm running around like crazy trying to soak up all the land time I can get before the ship me back out to sea. So sorry for all the lapses in blogging, but really I'm just enjoying myself too much to tie myself to a computer - nor do I have a smart phone, so you guys get the short end of the stick on this one. I did however get around to doing nails on myself, so you'll have a post from me, by me, very very very soon :) And I'm really excited on how they turned out! "Hey guys, my name is Hajni, im a manicurist from Hungary. I have been doing nails since 2008. I like it a lot, I consider it more like a passion than a job. My favourite part of it is custom painting that makes my clients nails beautifully unique. It always cheers me up when I see my clients being just as happy as I am when I finish a nail. I use acrylic paint, but I would like to try the aquarelle too. I hope you like my photo gallery." 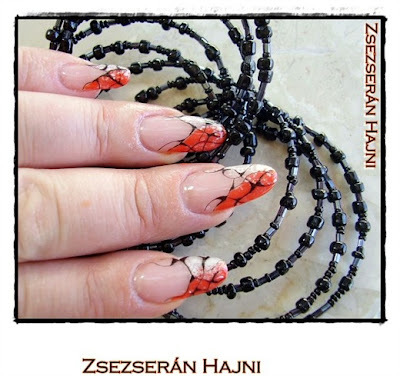 As always, I wanted to feature Hajni because I follow all her work myself. 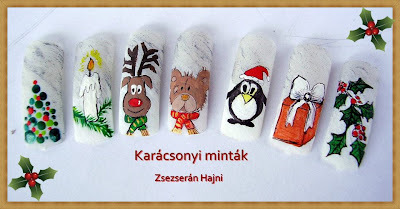 If you want to follow her too, please visit her Nail Magazine's nail art gallery or find her on Facebook. As for Little Lady Luxury, things are starting to get better for me. I think I may have finally kicked this bronchitis, and narrowly avoided whatever virus my sister tried to spread around the house. 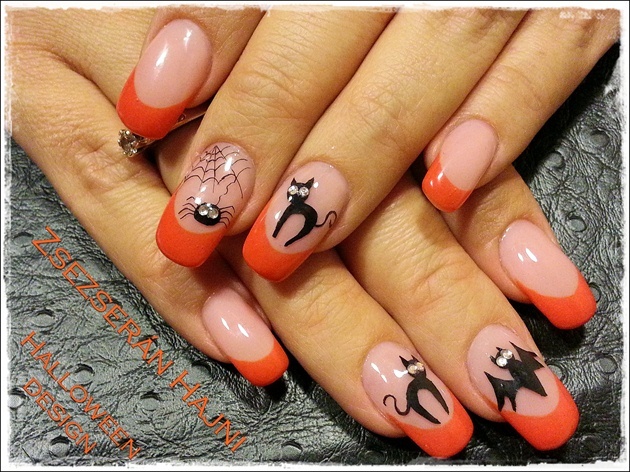 So, now that I have all this spare time not at work, and not being sick, i think its time to break out my practice hand and do some nails : ) I can't wait! I have so many things to try. That's all for me today. Another HUGE thank you to Hajni for letting me feature her work.